"We're going to do our own handmade butter, using just cold, heavy cream. It's done with no heavy equipment at all, just good old-fashioned arm power. It's the original elbow grease!" Pour cream into the jar and screw on the lid. Shake jar until butter forms a soft lump, 15 to 20 minutes. Continue to shake until buttermilk separates out of the lump and the jar contains a solid lump of butter and liquid buttermilk. Pour contents of the jar into a fine mesh strainer and strain out the buttermilk, leaving the solid butter. Remove the lump of butter and wrap in plastic wrap. Refrigerate until needed. 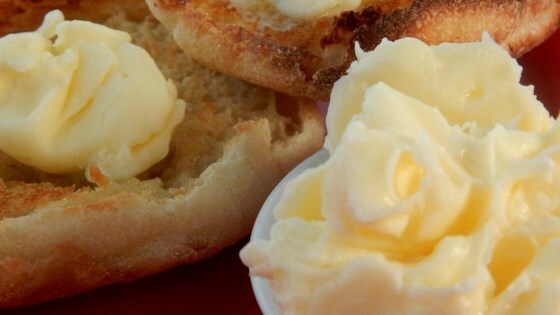 See how easy it is to make fresh butter from scratch. You can do this in a food processor much faster, but I wanted to go old-school. I must be the only adult in the world who never did this as a kid so in an effort to recapture my youth, I tried this. What fun.. and soooo delicious! When I was a kid, which is 70 yrs ago, my grandma used to sit us on the floor and give us each a quart mason jar to shake til we made butter. We (5 of us) thought this was great fun. I made butter. I'm pretty sure this is how man felt when he discovered fire. I had never heard of this before, and I was so proud of myself for making homemade butter! lol It tastes good, I would add a bit of salt next time. Thank you Chef John, you're right, it was fun!! I did this myself over 50 years ago when I was in kindergarden! I still remember it!